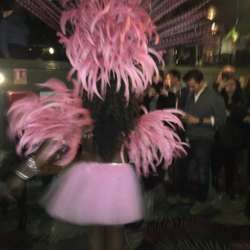 Let's celebrate Brazilian Carnival aboard the sumptuous boat "Jardins du Pont Neuf" for our first March event, and meet many other global minds ! This large boat is located just in front of the Pont Neuf bridge (métro Pont Neuf line 7). From the Peniche you will have the privilege to enjoy amazing views over Ile de la Cité and many historical buildings along the river Seine! For those who are not familiar with this venue yet, the boat has a huge heated terrace plus several indoor rooms, which makes it very pleasant to mingle even if it rains. The entrance fee includes one drink (caipirinha or glass of wine or beer or soft drink) plus 4 small tapas per person. 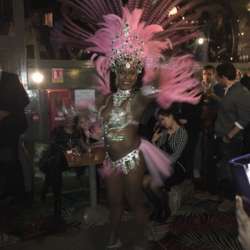 Samba show by the professional dancer Livia from 9:30 pm till 10 pm, and Brazilian music played throughout the evening (but also other musical styles) ! This is a wonderful occasion to mingle and meet new friends and/or establish business connections in a magical setting! The boat will be entirely ours and it will remain stationery throughout the evening so you can attend any time between 19:00 and 23:00. Beware of copies and taste the unique flavor of InterNations Paris Official Events, the largest expats' community in the world! To get there take the metro to Pont Neuf (line 7). Exact address: Quai de l'horloge Paris 1.